1,576,800 minutes ago (3 years doesn't sound nearly as cool) a Little Monkey called Henry, entered our world and changed our lives. Full of love, wonderment, excitement and the need for everyday adventure, this little boy brought along an incredible imagination. From being a nighttime superhero and saving the world from naughty villains (poor Georgie - forever the villain) or battling dinosaurs for their righteous spot on top of the rocky mountain (aka the footstool), the role play never ends. So when it came to planning Henry's 3rd birthday party, I knew it had to be something magical. Something that would further ignite his already active imagination. So currently obsessed with dinosaurs, throwing a Jurassic themed party, seemed like the perfect way to go. 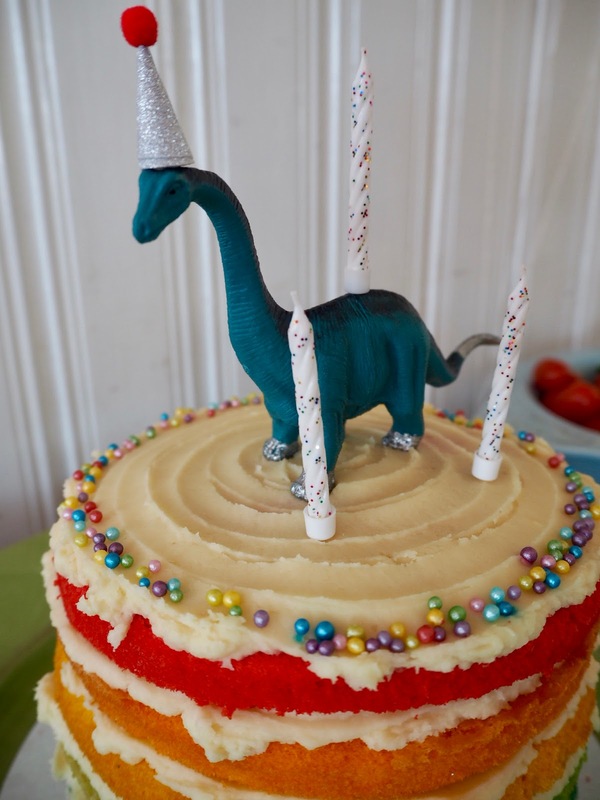 But OH MY GOODNESS... have you ever googled 'Dinosaur Party'? The choice is unbelievably overwhelming and not having all the time in the world, I found it to be incredibly time-consuming. Also as someone that Pinterest's her entire life, I could feel myself hyperventilating at the thought of pulling this together (on a budget - yep the husband had to get involved). 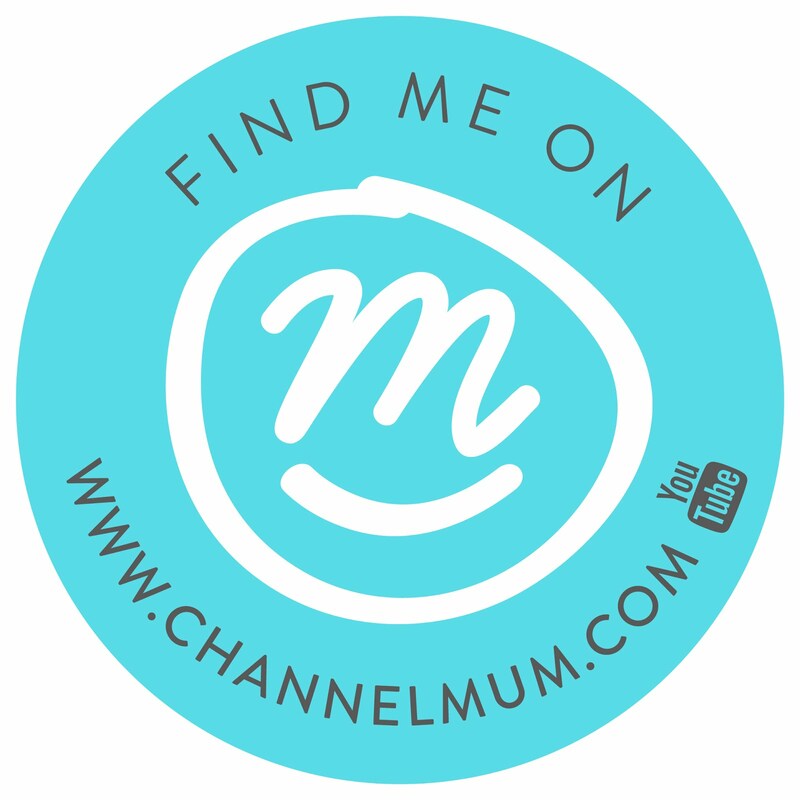 However, I did stumble upon a marvelous website called Kit and Caboodle that was dreamed up by two Mums, Alice, and Danielle. These super creative parents have taken away the stress of party planning, by creating the ultimate party in a box, delivered right to your door. Everything from the decorations, the balloons (BIG and small), tableware, party games, goody bags, swirly lollipops, thank you cards, (which I never ever remember to buy), table confetti... they have thought of EVERYTHING. Beautifully done, the boxes are a treasure trove of vibrant colours and modern styles, that all together look like a Pinterest board you wish you had created. & the best part, they coordinate perfectly. All you have to do is select your theme and they have done everything else for you. So I selected the Dinosaur Roar Party and I was ready to go. My little paleontologist was ready to party. Alongside the party boxes, you can also add other elements to your party, in keeping with your design. Such as a personalised pass the parcel or something that I love, which are the cake toppers. I knew I wanted a rainbow cake for Henry, so I wanted to keep the rest simple. 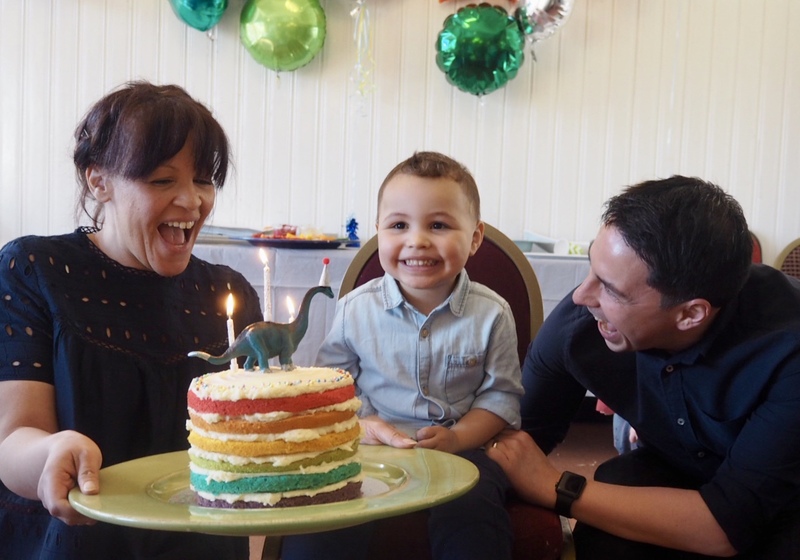 This Diplodocus Decorating Kit was literally the icing on top of the cake and he was very well behaved at the party (well done little guy). The kit also comes with other items you can use to decorate your cake, which I used later to top Henry's more simpler nursery sponge. OK, confession, I ate the popping candy myself, hey, it's not just for kids. The rainbow cake was by a local baker called Three Graces Bake Shop that I found on Instagram thanks to a friends bright inspired insta-account. The pops of colour complimented all the decorations around the room and oh my goodness, it tasted like heaven. Due to the mountains of buttercream layers, we were able to cut it down into smaller pieces for the children and adults later. For serving the food, I wanted to do something that was traditional to me as a child, which was a long party table that everyone could sit at. With all the gorgeous tableware from Kit and Caboodle, the long table looked super fun and would ensure I got a picture of Henry with all his friends. Also in the party kit were Triceratops face masks which were a big hit with boys and girls alike. The children also sat very well during their finger food and I was very proud of each and every one. So all set with my party in a box, the rest of the celebrations fell into place as Henry's theme was set. I purchased a bundle of foil balloons in an array of designs, in the same colours, ready to decorate the room. 4 days on, they are still floating strong in our living room. Being a 3 years old party, we also wanted something that would keep the children entertained throughout. So we hired a soft play area by Little Tiddles. This included safety mats, a ball pool, soft play shapes, animal rockers, a bounce and spin in the shape of a Zebra, tents for hide-and-seek and little bikes too take for a spin. Once the room was set, Henry was the first child to see it and he exclaimed WOW. He was completely and utterly in his element and loved shouting out all the dinosaur names he could see. 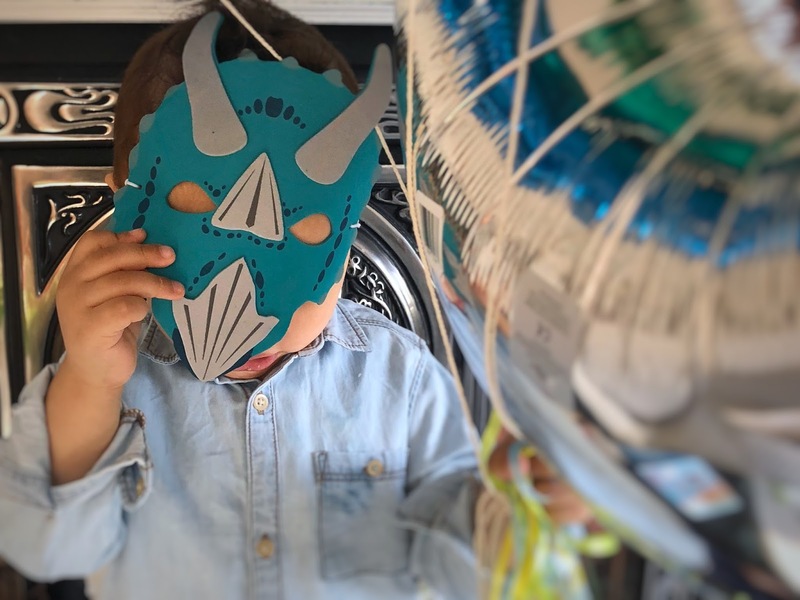 From the balloons, to the masks, to the Diplo-thingymagig on the cake, he was in awe. His little face was just beaming and this was further bursting with happiness as his friends started to arrive. The Kit and Caboodle girlies thought of everything, including a Dinosaur Spotify soundtrack, which I completely forgot about. However something I can use in the house with Henry later. We also didn't get an opportunity to play all the incredible games that were provided. Primarily as 28 children descended onto the party in the end (yep, I had a large gin that night) so there was never an opportunity. Howeve,r we have been working our way through them at home, which has delighted Henry. One such game is a jar full of water beads and hidden within our little dinosaur toys. He just has to pop his arms in and reach around for his favourite prehistoric animals. Did I mention it comes with 10 minutes of peace for me. Afterparty bonus. The pack also comes with food ideas, further games, tips on how long your party should last... the list is endless and I'm incredibly grateful for Kit and Caboodle for removing the stress that comes with party planning and giving me back time to spend with the boys, rather than on google. The gorgeous peeps at Kit and Caboodle our offering Peonie and Me readers a 10% discount online, just use discount code Peonieparty.